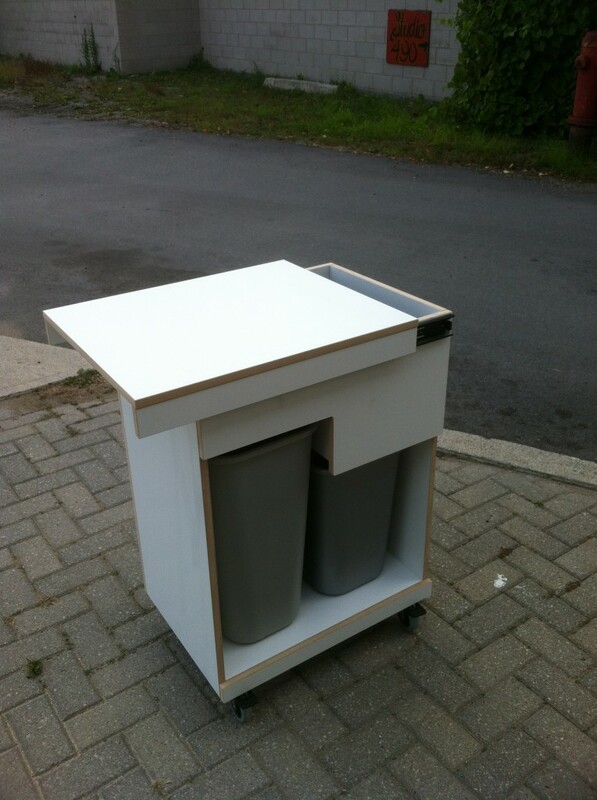 MEET TRASHY® The elegantly practical three-in-one kitchen island waste solution with built-in personality. Learn more about Trashy at www.gettrashy.com (requires Flash) or call 519-362-9552. Shown here: The standard Trashy, and 3 custom models (Oscar, Vinnie, and Double-Trash) as well as the current ready-to-paint Cheap Trash. 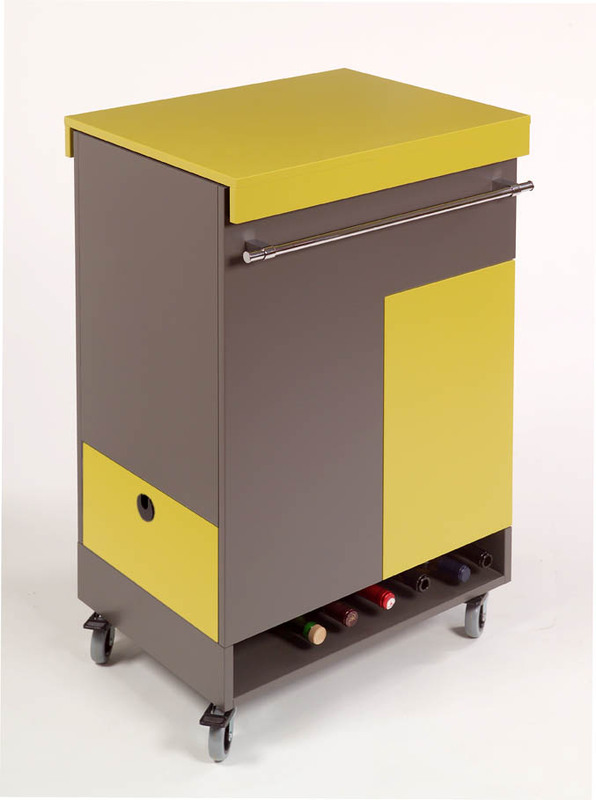 Metrik Studio’s new product is a free-wheeling (free-standing on casters) sorting island for the kitchen or office, with washable plastic bins for compost, recyclables and waste, and space for plastic garbage bags and used batteries. Trashy has a footprint of 48.5 x 62.5 cm (19 x 24 inches), and is 86 cm. 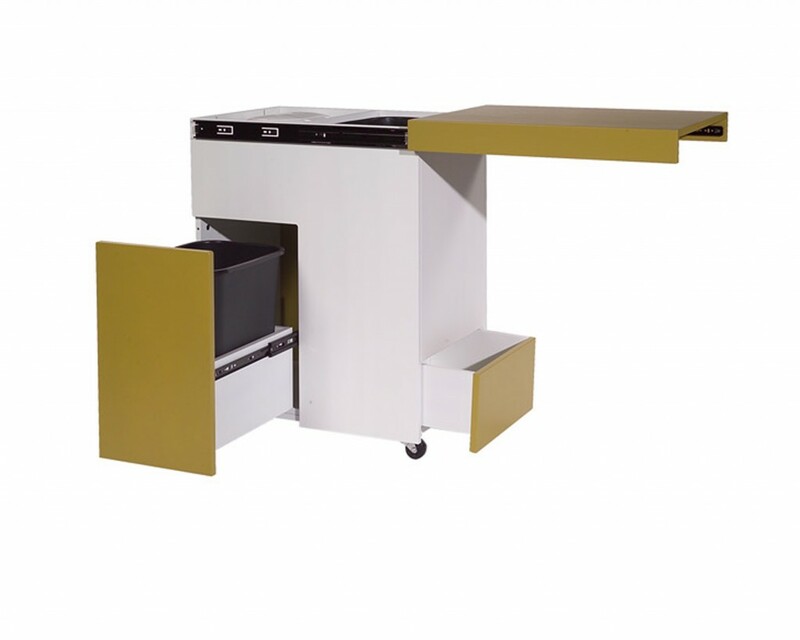 high (34″) on casters, with a sliding table-top surface – consider it as a small kitchen table/island with sorting capacity. Trashy’s lid slides to the side, leaving the inside exposed for throwing the recyclable (blue) and compostables (green) in. This sliding action allows the top surface to be used as a table top, with a 90 lb capacity. 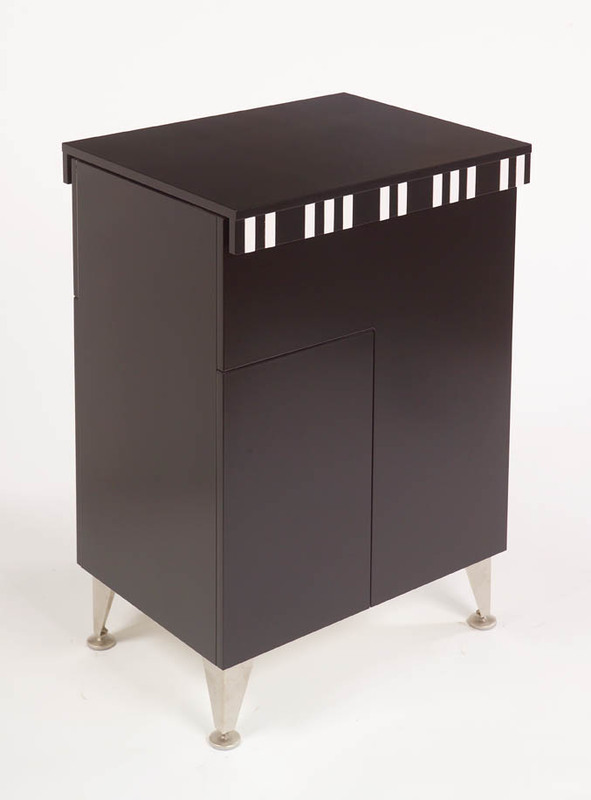 There is a small side drawer (for new bags), as well as a drawer (for landfill-type garbage) pulling straight out towards the user, like a conventional drawer. All bins are included with both units. The unit is available as either a left sliding lid, or right sliding lid, although the direction can be reversed at a later date if desired. It rolls on soft casters on the floor, or is also available with 4″ or 6″ nickel finish legs, instead of casters. Other options are for towel bars, a blackboard front for toddlers, or custom styling to suit any space. 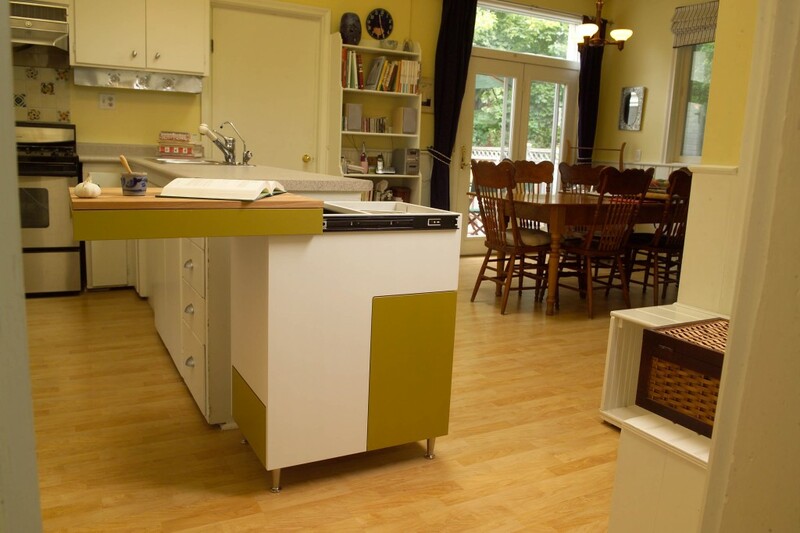 It’s perfect for use as an island, and an optional butcher block top allows allows for restaurant style cut & compost. 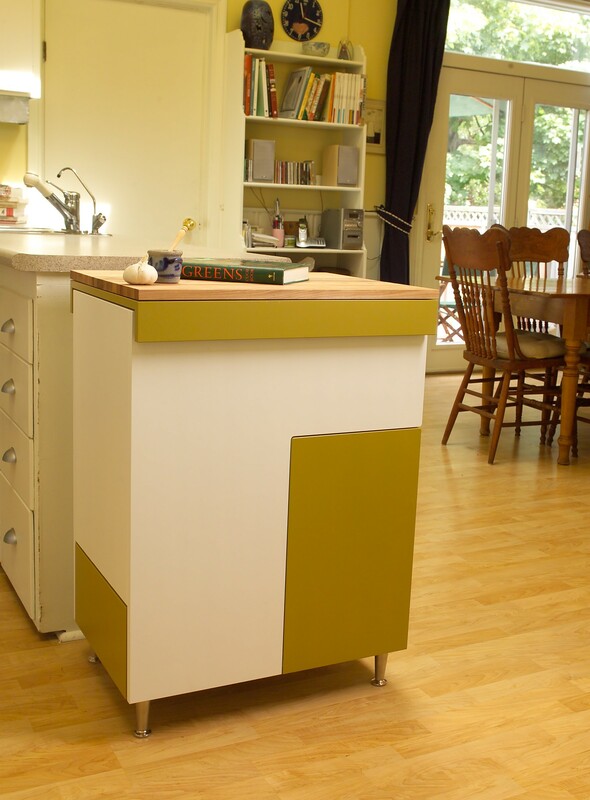 Trashy also frees up a kitchen cabinet worth of space which is now in-efficiently devoted to waste bins. Trashy is finished in a choice of 3 two-tone washable lacquers, and is produced of Arreis, an ecologically sustainable fibreboard made from 100% recycled wood products, with zero formaldehyde emissions. 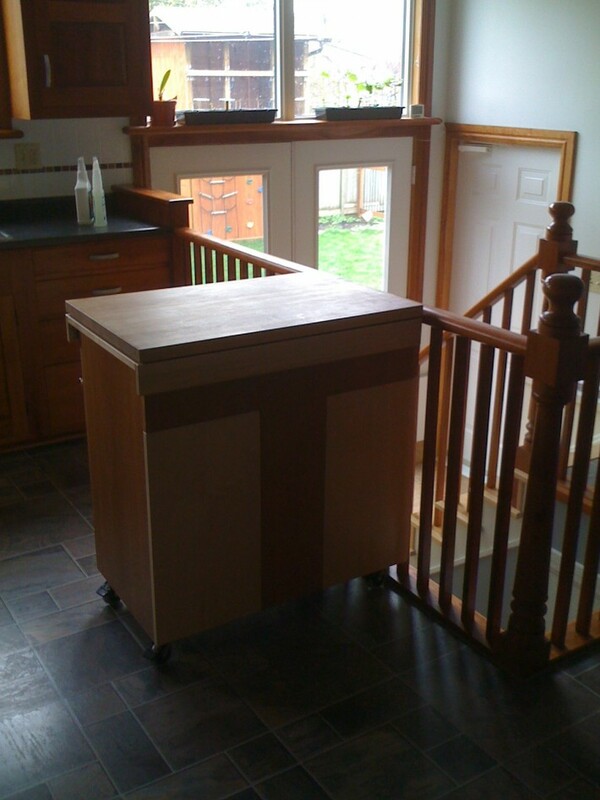 After you have paid for and landfilled a few big-box-store “kitchen islands” Trashy and Cheap Trash will still be going strong – the slider hardware is real hardware, designed to last – the casters won’t collapse in a year – the towel bar will still be tight when it’s passed onto your children – Trashy’s lacquer finish is the best catalyzed lacquer, and can be recoated in 10-20 years or when it needs it – best of all: these Canadian made units are built by a facility carefully managing it’s waste – both Trashy and Cheap Trash are made from a LEEDS-creditable recycled board, and all building-related materials are carefully recycled. The sum is an easy to use, organized, and fun side-kick for the modern trash sorting hero. Design credits: Shannon McLeod, and Erik van M.
Trashy ® (the original) now retails for $695 while stock lasts, and the sibling Cheap Trash, ready-to-paint, retails for $225, or $350 lacquered. Cheap Trash, an open unit which does the same job with less bells and whistles, is also constructed of Arreis, melamine coated. Both units are currently being batch-produced in lots of 35 units, and then customized and/or lacquered to order. Comments Off on Get Trashy!